Notice that swirling line of black specks above Santa Maria Novella? Those are the starlings. 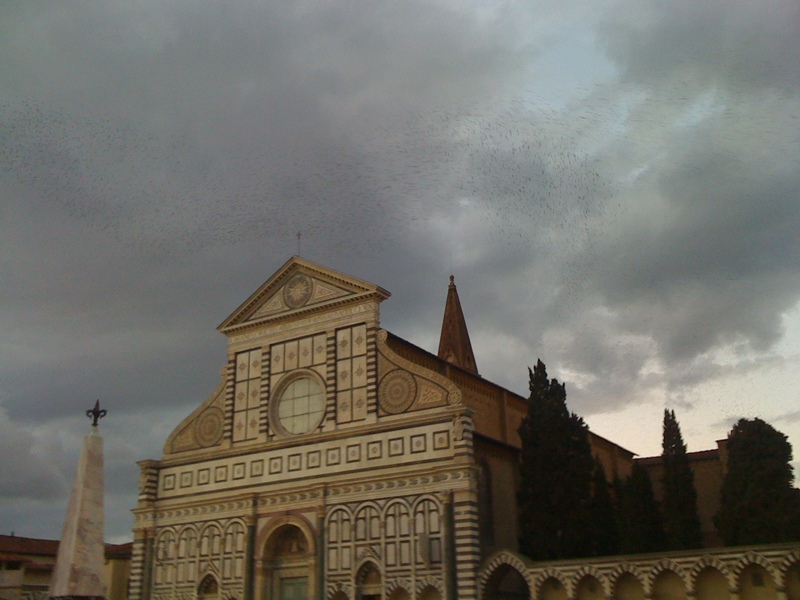 The photograph is from 2009, but I remember these birds descending on the groves of Santa Maria Novella for as along as I’ve been visiting the site. Construction of Santa Maria Novella began in 1279, when Dante was 14. I have no way of knowing whether these starlings were hovering around Florence’s centro storico back then, but the passage from Inferno 5 reminds me of those other instances where Dante may be drawing on local touches for his imagery and insights. And I can never read about the “schiera larga e piena,” “the wide dense flocks” of those who died for too much love in Inferno 5, without picturing the starlings of Santa Maria Novella. Learn more about these Florentine birds here. This entry was posted in General and tagged Dante, Divine COmedy, Florence, Inferno, Joseph Luzzi, Paolo and Francesca, Paradiso, Santa Maria Novella, starlings by josephluzzi. Bookmark the permalink. Reblogged this on Joseph Luzzi.